I grew up in the 1980's. I am not ashamed of this. I own up to the lace gloves big bangs and all the other craziness that came with it. This show is the funniest show I have seen in years. On multiple episodes I have had to hit pause as I laughed until I cried. This weeks episode was no different. This week was the Goonies episode. I love the Goonies. I saw it probably 10 times in the theater. I have seen it many more times at home than I can possibly count. I know the dialogue by heart....embarrassing, really. They re-enacted scenes from the original movie and they did it in such a way that was true to the original and yet nothing short of comedic genius. I have not laughed so hard since before the Olympics. 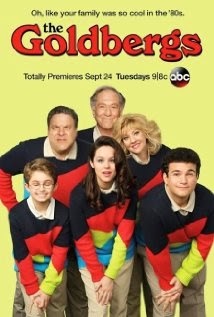 I suppose it is because the Goldbergs remind me a bit of my family from back then. WOW the nostalgia is so perfect and endearing. I can not not watch this show. Please...for the love of God, if you were around in the 80's please check out this show and make sure your friends do too. It is well worth the 30 minutes and I promise it is a good laugh! I hope ABC keeps this show going for a long while. Congratulations to Adam Goldberg and to his amazing family.